Brushy Peak Regional Preserve is a regional park that is part of the East Bay Regional Parks (EBRPD) and the Livermore Area Recreation and Park District (LARPD) systems. 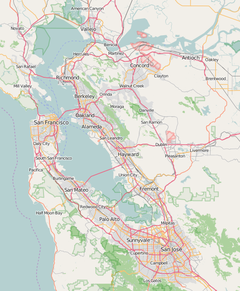 It is located in unincorporated land in Alameda County, just north of Livermore, California. The preserve's southern boundary is across the street from Springtown, a section of Livermore that is north of the I-580. You can reach the park from Livermore by taking Vasco Road into Springtown, turning right onto Northfront Road (Altamont Pass Road), and then turning left onto Laughlin Road. As you drive north along Laughlin Road, you can see Brushy Peak Preserve on the right and housing developments to the left. After this section of Laughlin Road, the road narrows to a one-lane road with ranches on either side. The road winds through a short canyon before reaching the staging area, where a ranch is located. From the staging area, hiking trails go in three directions: West Side Loop Trail, Brushy Peak Loop Trail, and the Laughlin Ranch Loop. The West Side Loop Trail is a 2-mile loop trail. The eastern side of the loop trail runs through a flat valley (part of Brushy Creek), at an elevation of approximately 700 feet (210 m). The trail then turns west, steadily climbing a hill, before it turns south and nears the top of the 1,100 foot (340 m) peak. At this point, it begins to come back down the hill and returns to the staging area. The West Side Loop Trail runs closest to the Vasco Landfill. As a result, birds can often be seen crowding around the hills to the west of Brushy Peak Regional Preserve. This is most easily seen from the West Side Loop Trail. The Brushy Peak Loop Trail opened in 2008. It is a 4.4 miles (7.1 km) loop that starts at the Laughlin Staging Area, where the elevation is 640 feet (200 m). The trail follows an old ranch road past several small ponds. The trail turns here, climbing the side of a hill which is covered in eucalyptus trees. The trail continues to rise, becoming a single track trail. It continues to climb through a region of scattered rocks. While reaching an elevation of 1,340 feet (410 m) over a distance of 2 miles (3.2 km), small oak trees are seen. The narrow trail then goes through a pass and winds down the west side of Brushy Peak. At this point, the trail turns south, winding along Brushy Creek until it reaches the West Side Trail. A collection of shorter trails dominate the southeast section of the park. These trails generally go around hills, reaching elevations of 700 feet (210 m) to 1,000 feet (300 m) over grasslands. Windmills can be seen from these trails. The southernmost trail in this region of the park, the Dyer Ranch Trail, connects with Laughlin Road near Springtown. The park is named for Brushy Peak (elevation 1,702 feet (519 m)), a mountain in the Diablo Range, that has had historical significance dating back to Native Americans who lived in the region before the arrival of European settlers. It was a focus of trade routes that connected the Bay Area Ohlones, Bay Miwoks, and Northern Valley Yokuts. According to the EBRPD, "The Ssaoam triblet of the Ohlone peoples was probably the most closely linked to the Brushy Peak area, living in the surrounding dry hills and tiny valleys around the peak and nearby Altamont Pass. Ssaoam populations in the dry summer months may have dispersed and reconverged at various camps throughout the year." The first European to make an expedition into this part of California was Pedro Fages, who passed through the Livermore Valley in 1772, on his return from Monterey. Mission San Jose (in present-day Fremont) was founded in 1797, and the Ssaoams lived there from 1806 to 1836. As mission lands were converted into ranchos by the Mexican government, some of the people left Mission San Jose to work as laborers on the new ranchos. The land was probably grazing land for cattle from Rancho Cañada Los Vaqueros. During the California gold rush, Brushy Peak became a hideout for bandits, most notably Joaquin Murietta (1829 - 1853). By the 1870s, the land around the peak was becoming increasingly occupied by immigrants from the east, and less hospitable to the outlaws. In 1900 and 1901, the Bohemian Club of San Francisco held outings on the top of the peak. The Livermore Area Recreation and Park District (LARPD) identified Brushy Peak as a potential city park in the early 1970s, and acquired 507 acres (205 ha) for that purpose in 1974. In 1997, LARPD and EBRPD formally agreed to cooperate in the further acquisition, planning, and protection of Brushy Peak Regional Preserve. On April 3, 2014, two conservation groups, Center for Biological Diversity and the Alameda Creek Alliance, announced the acquisition of a 79 acres (32 ha) land parcel known as "Eddie's Flat", adjacent to the western boundary of Brushy Peak Regional Preserve. Hours vary through the year, so potential visitors should call 888-EBPARKS (888-327-2757), option 3, extension 4512 about times. There is no access fee. Access to the top of the mountain is closed to the public to protect grounds that were sacred to ancient Native American tribes. LARPD offers guided tours to the top of Brushy Peak and to the northern part of the park. Call LARPD at (925) 373-5707 for information. Note: Although a restroom exists, there is no drinking water at the park. Visitors need to bring their own. The park offers opportunities for hiking, biking and nature study. Dog walking is permitted. Dogs must be on a leash at all times. ^ Visitors are only allowed into the Vasco Caves preserve on ranger-guided tours. Call 1-888-EBPARKS for more information. ^ "Republic Services Vasco Road Landfill - Livermore, CA". Yelp. Retrieved 2017-12-06. ^ "New Brushy Peak Loop." Trip Advisor. Retrieved September 17, 2014. ^ a b c "Brushy Peak: hiding in plain sight. Stienstra, Tom. SFGate. January 19,2013. Retrieved September 2014. ^ "Brushy Peak Map" (PDF). ^ Press release by Center for Biological Diversity. April 3, 2014. Retrieved September 17, 2014. ^ "Vasco Caves Regional Preserve." East Bay Regional Parks District. Accessed March 10, 2017. "East Bay Wild!" Word Press. 2017. Accessed December 26, 2017. Photographs and text describing Brushy Peak Regional Park Preserve. This page was last edited on 13 April 2019, at 13:30 (UTC).